The gyrocopters maneuvered some more, while the seekers and hold guardians moved up a bit towards my lines. The king’s unit reformed to face towards my Eagle Prince. Shooting was yet again uneventful, while the magic put augments on the Hold Guardians. 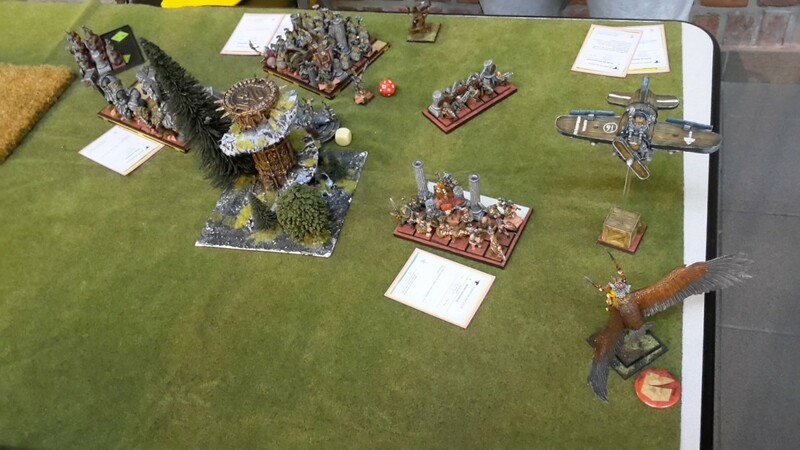 In my turn, the Eagle King charged the rightmost Gyrocopter, the Kestrels connected with the left one, while the Totemic Summon rear-charged the handgunners. The rest of the army maneuvered with a bit more confidence now that the redirectors were gone. Between magic and shooting another five seekers died, bringing them now down to 14-strong. 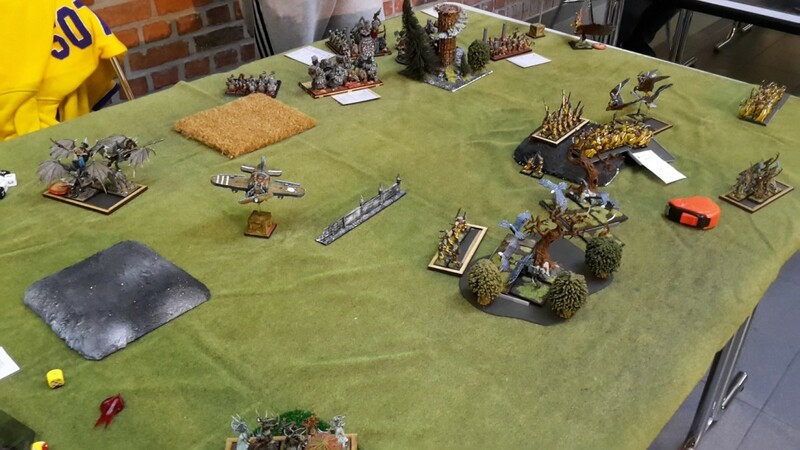 In combat both gyrocopters died, and then the totemic summon surpassed expectations: it won combat by virtue of charge, and my opponent kindly failed his Ld10 rerollable test, sending his scoring unit fleeing off the board! With the secondary objective already in the pocket things were looking good for the Sylvans. 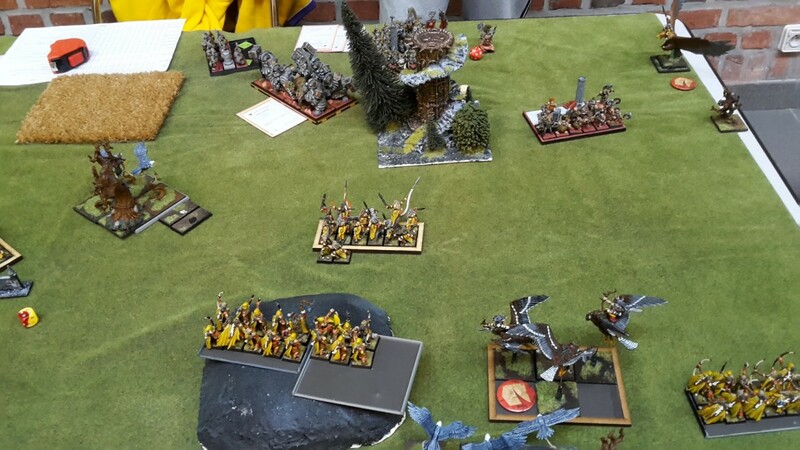 The vengeance seeker charged my victorious Eagle Prince, while the rest of the army maneuvered slightly with no real good option available: if theHold Guardians charged the eagles right in front of them, they’d get a combined flank charge by Blade Dancers and Kestrels. 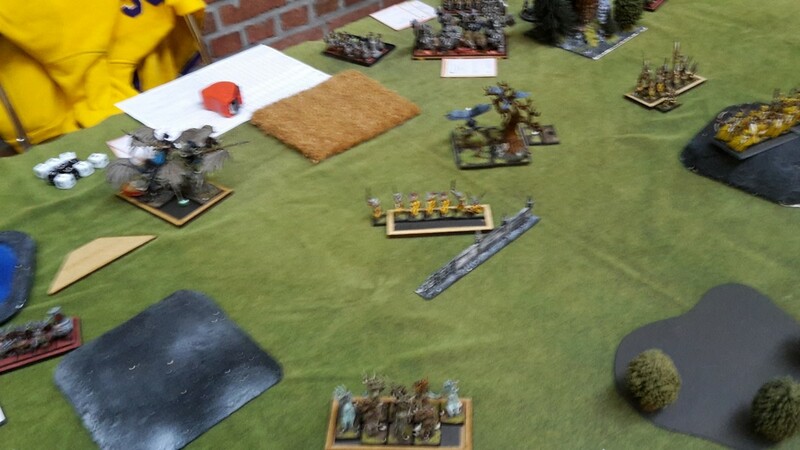 So instead my opponent buffed the unit with runic magic and reformed to protect his flank. The Prince shrugged off the hits of the Vengeance seeker and proceeded to deal the last wound needed to kill the dwarf. In my turn the leftmost eagles spotted the flank of the small Warrior dart and charged into them, blocking the passage of the Hold Guardians in the process. The Eagle Prince charged the anvil, landing barely beyond the front arc of the Longbeard unit. In magic I was able to cast Break the Spirit on the Hold Guardians, and a good round of shooting (now in short range) only left 6 seekers alive. 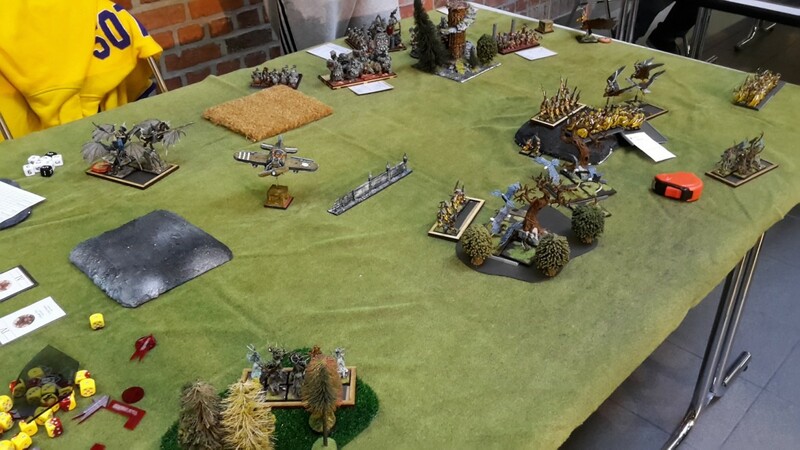 The Forest Eagles won combat against the warriors and held their ground, while the Eagle Prince left the Anvil with 2 wounds remaining. Lacking any other alternative, the Hold Guardians charged the Eagles right in front of them, losing a model to the Dangerous Terrain tests. In combat I managed to stop all of the runic spells that my adversary attempted to cast on them, letting through the rune of Gleaming on the seekers. 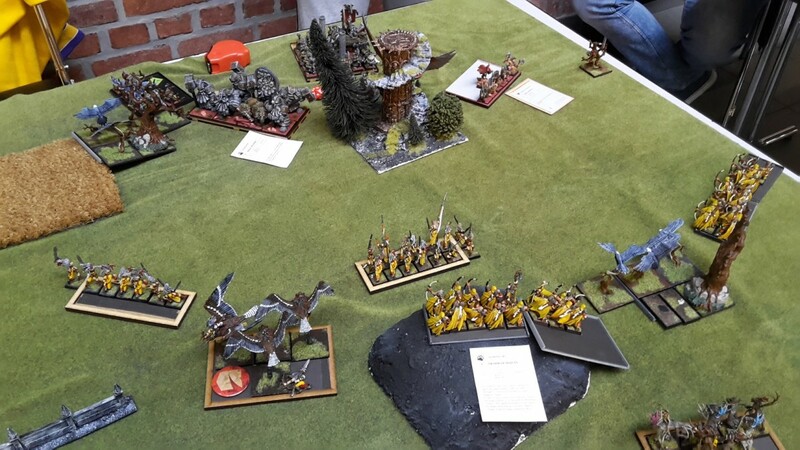 Combat saw the Eagle Prince finish off the Anvil, and in a surprising turn of events the Hold Guardians didn’t manage to do enough damage to the eagles to break them! The birds passed a ld4 break test and held, sealing the fate of the animated statues. 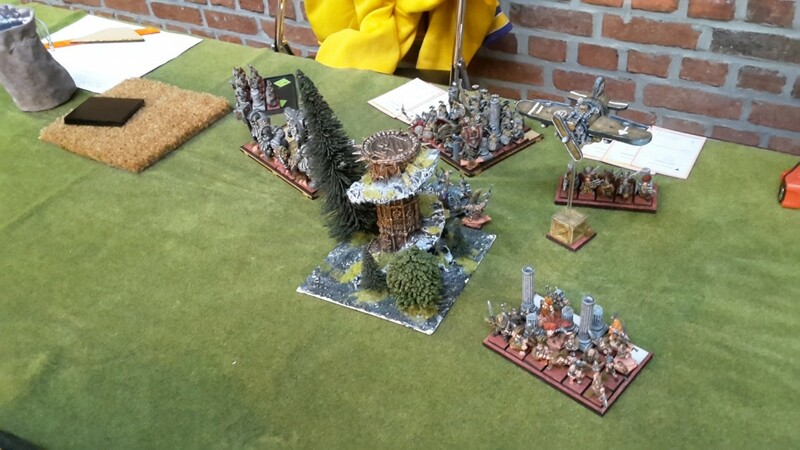 On the following turn the sylvans went on the offensive: a unit of kestrels charged the Dwarf Warriors, while the second unit tag-teamed the Hold Guardians with the Forest prince (rear) and the Blade Dancers (flank). Shooting and magic killed off he last of the seekers, and in combat the elves managed to deal 17 wounds to the Hold Guardians before they got to strike, breaking both units and pursuing them off the table. With only the Greybeard unit left, we decided to call the game there: I had no intention of risking a combat against the deathstar, and he’d have no way of catching my light troops during the last two turns. So the game ended up a 19-1 victory for the Sylvan Elves. 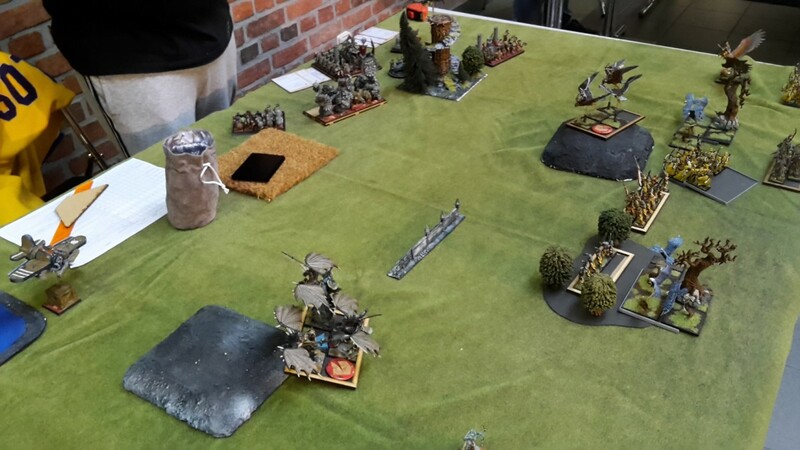 This game was relatively one-sided, mainly due to the deployment, but also due to a list mismatch: without significant shooting, the only hope that the dwarves had of winning this was to put pressure on my shooting troops and the small scorers, so as to win the scenario. By deploying deep and in a castle, the dwarves allowed me to single out the softer targets while preparing for the decisive blow: it would have been way more difficult to accomplish if the dwarves had deployed centrally, then taken the option of vanguarding forward in a uniform manner. With the help of the rune of resolve and the Dragon’s Breath, as well as with the Steam Copters in reserve to redirect the bladedancers when the time was right, this could have been a very different game. Overall the team did very well, scoring 78/80 points (with one game being forfeited due tothe opposing team missing a player). So we were propelled up to the top tables,where we would find familiar faces: the second part of the Team Belgium! Hi SmithF, the dwarf player in question in the report is me. Hey! It was a great pleasure getting to meet and play with you, and I'm glad that you did well in the rest of the games. I cannot praise you enough for your painting skills, your army looks amazing! I really like these battle reports, thanks for taking the time to post them. The combination of map graphic, pictures and commentary make it really easy to follow and to get a feel for the flow of the game. Thanks again for taking the time and care in putting these together. Really love the list. I've been interested in seeing how a bird type list would work, as I'm an ornithologist at work. Bladedancers are so good and a big and small unit makes sense. The big eagle units are value for money but what can they do? 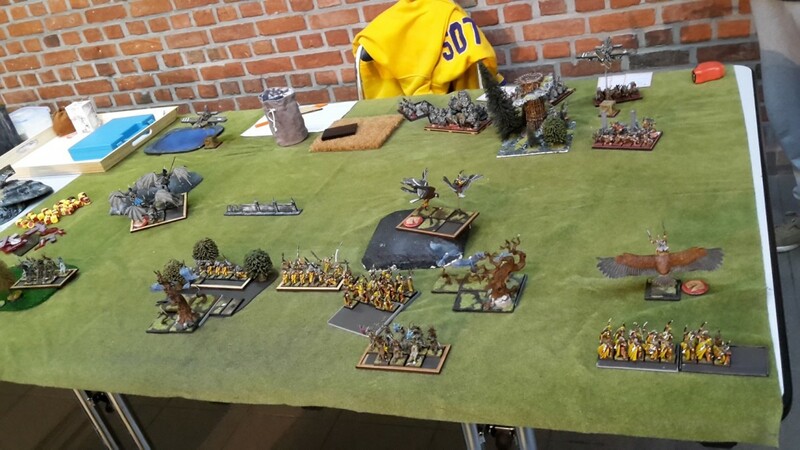 It would be a wrench losing my WH lord to facilitate this list and his cloat but saying goodbye to being redirected sounds good.....Anyway excellent first battle report. Looking forward to the next one. 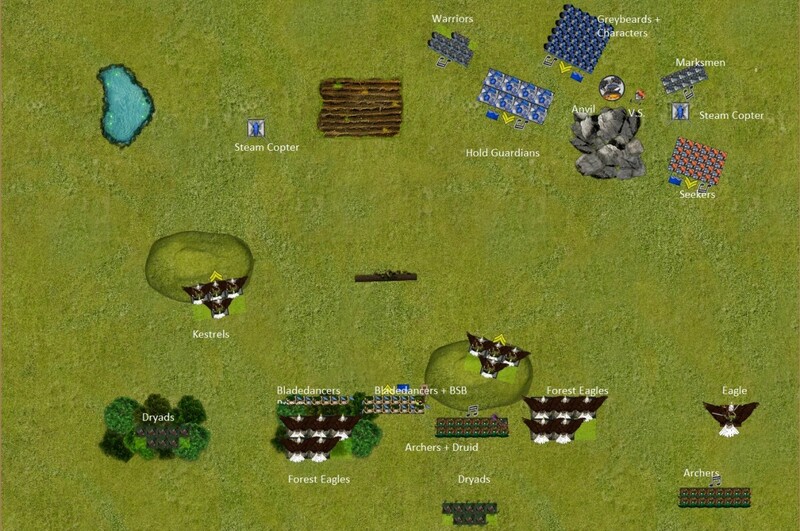 The eagle units were the biggest surprise of the tournament for me (I already knew that Kestrels and BD were great! ), they can fulfill a lot more roles than just redirector duty. You'll get a better idea of what I'm getting at in the next reports! Did.you feel one caster with 5 spells is enough? Five spells get the job done, really. I always had something useful to cast: early on in the game it would be a combination of Totemic Summon/Chilling Howl (if needed) and Break the Spirit, and afterwards the focus would be Awaken the beast/Hereditary/Savage Fury (again, if available). I think that the biggest challenge is the fact that all of the Shamanism spells are useful: at times I didn't know which ones to pick! If I had the points, I'd definitely go for a Cosmology Adept so as to make sure that I had decent ranged options and double strength buff. But that's the equivalent of an entire Bladedancer unit, so I settled with the "cheap" option.